Welcome to the home of one of fandom's last bastions of Classic Trek fandom! Orion Press has served fandom since 1979, and now hosts one of the largest collections of Classic Star Trek fan fiction on the Internet. 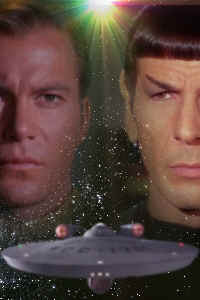 On this website, you will find a variety of material designed for the discriminating Star Trek fan. All we ask is that you drop us a line, and let us know how we're doing, how we can improve, and what you liked or disliked about the site, the stories, the articles and the like. We want to hear from you! And hey, be sure and check out Project: Potemkin, a fan film series we're setting in the Orion Universe. The first nine productions are ready for viewing. Lastly, we're in the process moving the website to: www.orionpressfanzines.com! Please notify me of any errors at randy@orionpressfanzines.com, I'll get at them immediately. Please pass along the main website link to your friends. We don't want to lose any readers during this transition. Joan Verba's excellent look at why fandom has always mattered! let us know if we've missed anyone! need to talk with the authors or editor? want to join in on the fun? come join us! please consider making a small donation to our website. Thanks!